This product was perfect for what I wanted. My little girl was born with some heart problems. Safe to say I was an absolute mess when it came to leaving the hospital. Scared and panicky as to what could happen I needed to find something to put my mind at ease somewhat while she was sleeping. So my mum purchased this product for myself a little pricey but at that point none of us were overly bothered. No false alarms, it worked when it needed to (which we hoped we would of never needed to know) but she is fine now thanks to this monitor we managed to rush to her aid. The alarm is nice and loud and clear. Ok. So this is a tricky one. I love the alarm system and feel it works well and doesn't give off any false alarms as such however there are a couple of design flaws. Bright blue light flashes on the alarm that attaches to the cot. This is so disturbing I don't actually know how my little boys manages to sleep with what is like a police car in his room!! Alarm sensor sound - it goes off on the alarm attaches to the cot and not actually on the monitor. It is very piercing so just scare the baby when it goes off! The camera is clear enough and the talk back to Baby is also good. I do like this product however we were lucky to get it on offer otherwise i would have returned it. I got the baby sense with a different Motorola monitor but thought it worth a review because I’ve been sleeping a lot better since purchasing this. If you are like me, having to check baby every hour during the night to make sure there are no issues then this is the product for you. After a quick test it proved a very loud alarm and is very responsive. It’s non intrusive so no blinking lights in the night, just a soft green light to indicate all is OK.
It’s battery only and I think I’d prefer it to be charged but that’s just my preference. Remember to switch it off when you do your night time feeds as I forgot a few times and gave my sleeping partner a fright! Worth the money for peace of mind and more importantly- sleep! Noisy, can’t hear his breathing. We bought before my son is birthing in ASDA bargain. I think ONLY £40. Great product but binatone is sometimes make a mistake. Monitor sometimes loses the signal, but we use almost 2years and we don’t have a problem with this product! Bought this shortly after coming home from hospital with baby as he was sick in the nights and I worried he would choke, it’s provided me with peace of mind knowing the monitor will let me know loudly if there are any problems. I would have paid more if I’d had to. 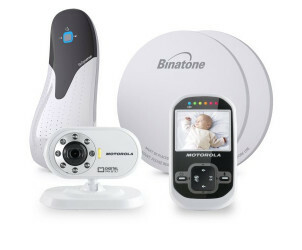 This Motorola MBP26 Digital Video Baby Monitor Babysense Bundle is the ultimate set. Includes the Babysense 5 sensor mat alarm to give you complete reassurance that your child is resting peacefully, as BabySense are the only medically certified sensor pads in the market. 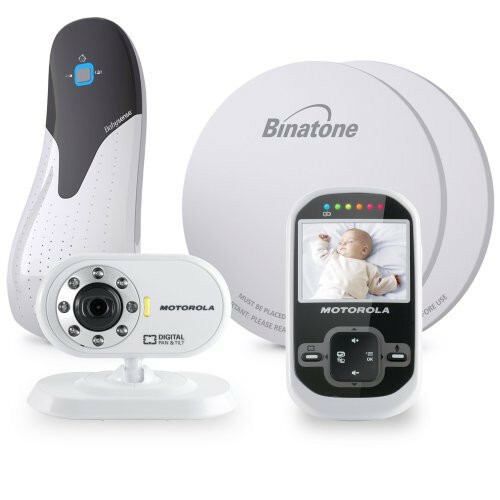 The full colour LCD screen with infrared night vision provides confidence that you will not miss a movement if your baby needs you, and superior sound technology for peace of mind that your child will transmit loud and clear, with up to a 200 meter range. If all that wasnt enough, Data encryption is built-in for added security.